An article in Time Magazine about the NASA space shuttle program mentions the Buran, which up until a few days ago I didn't know existed. It had a much shorter life and a sad ending but that doesn't change the fact, that the Russians had a space shuttle. Not only that, but arguably it was better than the NASA one. In case you missed it, according to this computer rendering, unmanned (?) bombers would come out of the shuttle over the U.S., dive down into the atmosphere and attack. 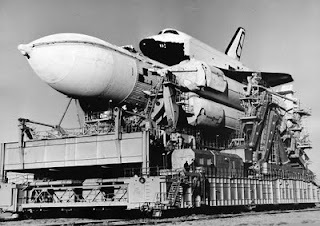 There are numerous sites that provide a dry, factual description of the Buran. Examples are Wikipedia and Knowledge Rush. However, one of the more intriguing sites is Buran.ru, which contains a lot of drawings, pictures and video of the Buran. The site lists differences between the American and Russian space shuttle, most notably its ability to automatically land itself. There are also other differences, such as horizontal transportation to the launch site, higher payload and better resistence to heat. Some of the pages I liked the most on the web site was the main Buran page and the abundance of pictures (multiple pages). 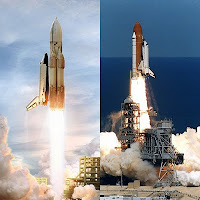 Beyond the urge to dismiss it as a copycat of the NASA space shuttles, it is very interesting to see the differences. For cost reasons, the Buran was shelved. The cold war ended, the USSR divided to a plethora of countries, focus was shifted. After one unmanned orbital flight in 1988, the Buran landed automatically and flawlessly, only to never fly again. The project lost stamina and the Buran was shelved in a hangar in Baikonur, Kazakhstan, location of the Cosmodrome. In 2002 the roof of the hangar holding the Buran collapsed, destroying the rare artifact of the Russian shuttle program, as documented in these pictures and video. An amazing movie could be made on the Buran. Its purpose, development, unique abilities, technological success and yet short life and tragic ending would be good Hollywood material, or at least an HBO miniseries. Tom Hanks, how about it? great post! i've always thought the modern space age would be much different had the Russians been able to make their own re-usable craft work. The article is from 11/2008.